As everyone knows, the weather in Calgary can be quite unpredictable! We are all familiar with the occasional snow and frost in April, May and sometimes June, which coincides with the start of our growing season. Due to the unpredictability of the weather, Grow Calgary tries ensure a top-notch growing season by germinating plants early in the greenhouses so that they are ready to plant once the weather starts to cooperate. Weather isn’t the only determinate when deciding to germinate plants. The type of plant, availability of water and sunlight are also important, as well as soil temperature and number of frost days prior to seeding/planting. Some may be wondering what is early germination and how does it work? Well, germination is the process by which a plant grows from a seed. Germination starts when a seed is provided with water and the appropriate temperature. The uptake of water by a dry seed is call imbibition, and as the seeds imbibe the water, they expand and the dried enzymes and food supplies then become hydrated. Once the enzymes have been hydrated, they become active and the seed is able to increases its metabolic activities to produce the energy needed for the growing process. The most common example of germination is the sprouting of a seedling from a seed of an angiosperm (flowering plants that produce seeds within an enclosure AKA a fruiting plant – Example: a Rose) or gymnosperm (seeds develop on either the surface of scales or leaves, often in the form of cones – Example: conifers). Water – Seeds are usually very dry and require a significant amount of water before cellular metabolism and growth can occur. Most seeds only need enough water to moisten them, but not enough to soak them. Temperature – Affects the cellular metabolic and growth rates. Seeds germinate over a wide range of temperatures, most of which have a set temperature range that they will not germinate above or below this range. Annual vegetables have an optimal germination temperature of around 24 – 32 C, although some species (e.g. radishes or spinach) can grow at significantly colder temperatures. Oxygen – Used in aerobic respiration, which is the main source of the seedling’s energy until it is able to grow leaves for photosynthesis. Oxygen is found in pore spaces. If the seed is buried too deep in the soil, or if the soil is waterlogged, the seed can become oxygen deprived. Sunlight – This can be an environmental factor, however most seeds are not affected by this. Favourites like tomatoes, peppers, zucchini are just some of the vegetables that need to be germinated before planting due to their long and warm growing seasons. At Grow Calgary, we use mason jars filled with soil and water to early germinate the seeds. Once germinated they are transplanted into soil in the greenhouses until they are ready to be planted in the ground. We are always looking for new volunteers around the farm. If you are interested in helping with the early germination of some of these vegetables, contact us through our website at http://www.growcalgary.ca/ and click on the volunteer tab! Since composting is so easy and rich in nutrients, Grow Calgary has developed an accelerated composting program! As you can recall from our previous blog post, compost is rich in nutrients and is beneficial to the soil. It acts as a fertilizer, soil conditioner, and can aid in the reduction of erosion. This addition of nutrients at Grow Calgary contributes to the overall health and fertility of the soils. This leads to an increase in yields, which directly benefits the Calgary Interfaith Food Bank Fresh and Local hamper program. To acquire the materials needed for a large scale composting program, Grow Calgary works with many local restaurants and food producers to access their commercially produced compostable materials. Some of the participating businesses are Cru Juice, Wild and Raw, and Red’s Diner. We receive sod, leaves, grass, and chips from local landscapers and arborists around Calgary. In addition, we assist 20+ Calgary companies with the diversion of organic resources from the landfill for use in our accelerated composting program! This program is part of Grow Calgary’s commitment to sustainable agriculture. Market Gardening, Urban Farming, & Commercial Organics Collection for Composting at Grow Calgary contribute to the health of our soil resulting in increased yields for the Calgary Food Bank Fresh & Local hamper program. Grow Calgary works with many local companies to acquire the materials for our large scale compost program. We source from local restaurants and food producers to access their commercially produced compostable materials. We receive grass, leaves, sod and chips from local landscapers and arborists. We assist 20+ Calgary companies with diversion of organic resources from the landfill for use in Grow Calgary’s Accelerated Composting Program. This is part of Grow Calgary’s commitment to sustainable agriculture. Compost is organic matter that has been decomposed and recycled many times over, and is used as fertilizer and as a soil amendment. Essentially composting requires a large amount of wet organic matter (known as green waste or raw materials), which include leaves, food wastes, grass clippings, etc., and waiting for it to decompose and break down into humus (the black soil found on top of an A horizon aka organic matter). Decomposition can be sped up by shredding the plant matter, adding water, and ensuring proper aeration by turning the organic matter. Worms, fungi further break up the material, and aerobic bacteria converts the inputs into heat, ammonium, and carbon dioxide. Compost is rich in nutrients and can be beneficial to the soil. It acts as a fertilizer, soil conditioner, and can aid in the reduction of erosion, reduce landfill input, and save you money! * Fun fact: over 60% of what we put into landfills each year is organic waste, and can be recycled through composting! 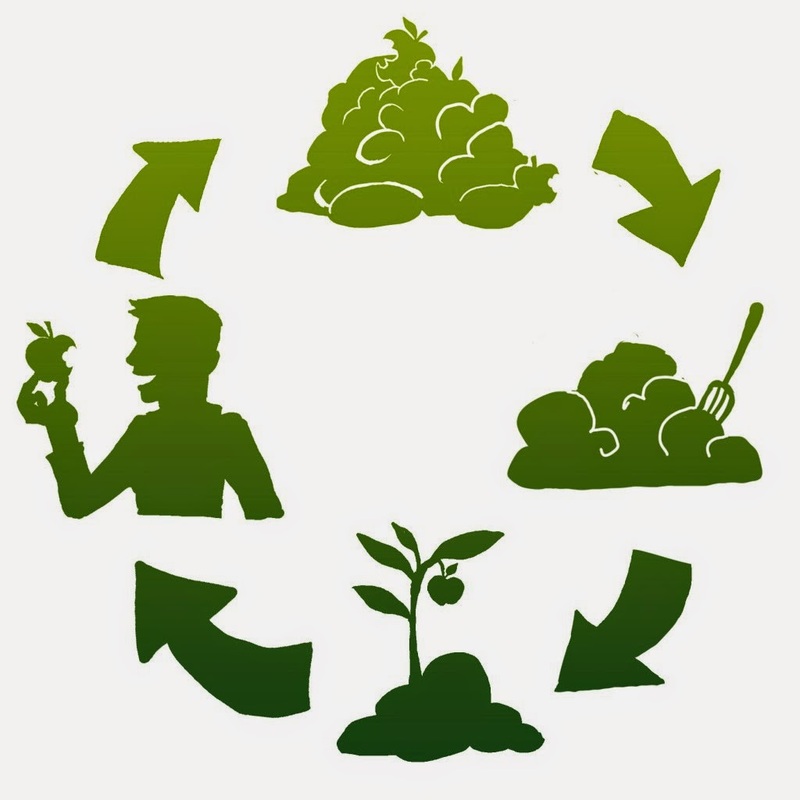 Compost is composed of 4 ingredients: carbon, nitrogen, oxygen, and water. A combination of these ingredients makes the perfect conditions for breakdown of materials. Composting on a small scale is quite manageable, however, on a large scale requires more thought and planning. 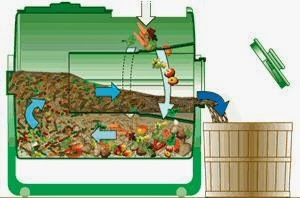 There are two different methods for large scale composting: wind-row composting and in-vessel composting. Turned wind-rows are essentially long narrow rows of compost that are turned or agitated on a regular basis. This turning/agitation mixes the organic matter and enhances passive aeration of the mixture. Passively aerated wind-rows are a little more complicated. With this method, air is supplied to the decomposing material via perforated pipes that are embedded into each wind-row. This therefore eliminates the need for turning or agitation. The ends of the pipe are open to allow for air flow in and out. Since the materials are not turned, it is important that the materials are thoroughly mixed before the are placed on top of the pile. Aerated static piles take passively aerated wind rows to the next level by using a blower to supply air to the organic matter. This method provides control of the airflow and therefore allow for larger piles. Just like passively aerated wind-rows, no turning or agitation is needed. Bin composting is the simplest in-vessel method. 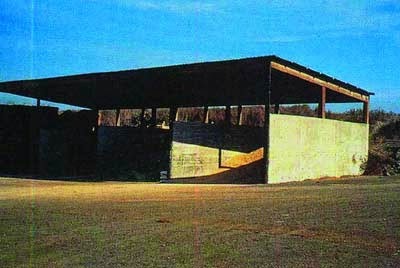 The organic materials are confined by walls and a roof and allow for higher stacking of materials. This method also eliminate weather problems, odour issues, and provide better temperature control inside. Bin composting operates in similar fashion to aerated static pile method. There is some forced aeration and little to no turning of the materials, although occasional remixing and turning of materials can speed up the process. 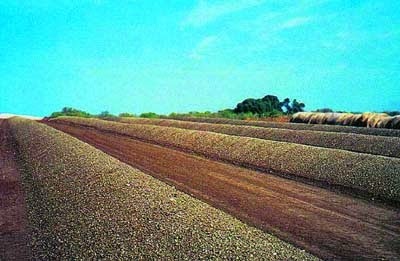 Rectangular agitated beds is a combination of controlled aeration with periodic turning of the material. The composing is done in beds (long, narrow channels surrounded by walls). A channel or rail on top of the surrounding walls supports and guides a compost-turning machine. Raw material is loaded at the front of the bed. As that turning machine moves forwards, it mixes the compost in the bed and discharges the compost behind itself. With each turn, the turning machine moves the compost towards the end of the bed at a set distance. Silos are another technique (which resembles a bottom-unloading silo), which involves an auger (large screw that functions as a conveyor belt) that removes the compost from the bottom of the silo, while a mixture of new raw materials is added to the top. There is an aeration system that blows air up into the silo from the base. A downfall of this method is the fact that stacking of the raw materials increases compaction, reduces temperature control, and increases air flow challenges. Since the materials in the silo do not experience significant mixing, raw materials must be thoroughly mixed before being loaded into the silo. Rotating drums is another method that employs a horizontal rotary drum to mix, aerate, and move the raw materials through the system. The drum is mounted on large bearings and its rotated through a bull gear. Air is supplied via the discharge end and incorporates into the material as it is tumbling, and moves in the opposite direction of the material.